Editor's note: This story originally misstated that the OMAP 5 series is quad-core. That has been changed. Every technology has a tipping point, a moment at which it proves itself worthwhile. 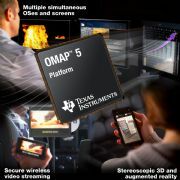 With tablet computing the moment might be on us with the announcement of Texas Instruments' OMAP 5 series of system-on-a-chips (SOCs; essentially, CPUs for mobile devices). Almost unbelievably, OMAP 5 offers quad-core computing at up to 2GHz with power consumption barely breaking into double-digit wattage figures. In terms of raw figures, that level of performance is very near that of current Intel and AMD desktop chips. In actual fact, however, the OMAP 5 series is not quad-core in the desktop CPU sense; the chip actually contains two Cortex-A15 cores, which is where the real power lies--and two Cortex-M4 cores, which are there to take care of day-to-day work such as keeping the display alive while the device is in sleep mode. The A15 cores can be clocked up to 2GHz each and will remain dormant unless needed. However, also onboard the chip are PowerVR SGX544-MPx graphics, which offer 3D acceleration, and there are built-in HD video decoders that can manage 1080p playback at 60 frames per second. Attach a stereoscopic display and you'll get 1080p playback at 30 frames per second. In fact, you can attach up to four displays simultaneously; three will run at 2560x2048 resolution, with the fourth utilizing HDMI 1.4a 3D. Additionally, the chip can accept inputs from three separate camera sources. Such a high number of camera inputs will support Kinect-style gesture-recognition controllers, but each can capture images of up to 24 megapixels. TI suggests that OMAP 5-powered tablets could drive a projector, for example, while somebody controls the presentation by interacting physically with the projected images. That sounds like sci-fi but, as the Microsoft Kinect has shown, we live in incredible times. The OMAP 5 series can use DDR3 memory too, just like what's found in most high-end laptops. In other words, this is pretty serious stuff, but it's all contained in a chip that's less than 2 centimeters from corner to corner. A 28 nanometer production process is used and although TI hasn't yet mentioned typical wattage figures, it does say power consumption is lower than previous generation OMAP offerings, which have already found homes in a variety of devices, including the Motorola Droid. We can expect devices featuring OMAP 5 chips next year, and we might even see some preview devices later this year. There's a slightly less powerful version within the range for cellphones too. Should a tablet manufacturer decide to go down the OMAP 5 route (and there are a significant number of competitors offering similar ARM offers), they'll be able to produce devices that--in terms of power, at least--effortlessly undertake just about any task we use our desktop and laptop computers for. Such devices won't be cheap, of course. At least for the next few years, OMAP 5 is destined only for high-end devices. But in their capability to offer the kind of computing power required for truly seamless tablet computing, OMAP 5 devices might just be worth the price.